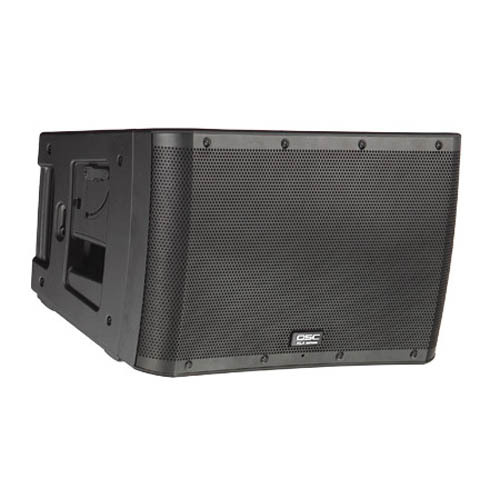 KLA12: Housed in a rugged ABS enclosure that results in both light weight and long-term durability, the KLA12 features a 12-inch low frequency transducer coupled with a 1.75-inch compression driver. Designed to be used exclusively as a fixed arcuate line array, each KLA12 is set at a 90° horizontal by 18° vertical splay angle, allowing 90° vertical coverage arrays to be configured using only five boxes (most other solutions require six). KLA’s unique self-contained SOLO™ (Single-Operator Logistics) Rigging System enables users to quickly assemble (and disassemble) the line array in a fraction of the time without the need for special tools or external hardware. The KLA12 Ar-Q™ (Arcuate Equalization) processing enables users to quickly tune the array, making appropriate frequency compensation adjustments based on the number of boxes. With the click of a dial, the user can select the total number of boxes deployed in the array resulting in an evenly balanced and accurate tonal curve. QSC’s proprietary Intrinsic Correction™, first introduced with the WideLine™ Series, actively adjusts time, frequency and amplitude response to achieve a maximally flat bandpass target.